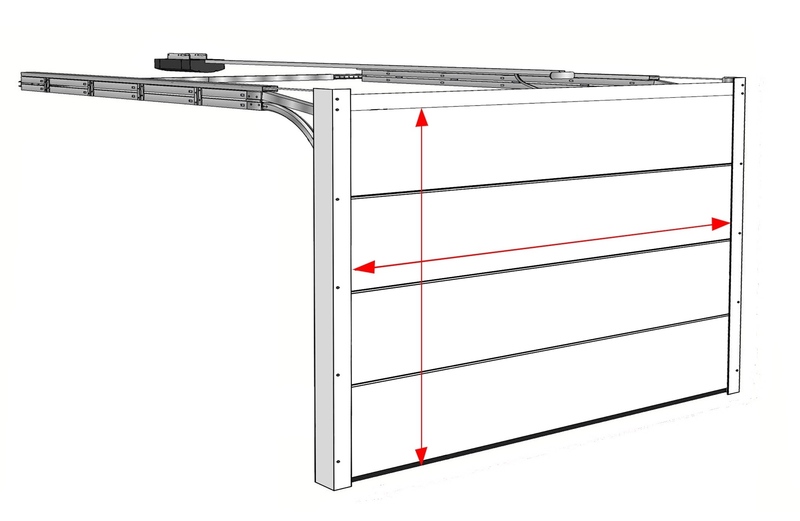 Choosing correct size sectional garage door and advice on how to measure. Sectional garage doors are almost always installed onto the rear surface of the brickwork aperture. They can also be fitted between brickwork and underneath the lintel of the garage opening. Please see both options below. Almost all makes of sectional door require a minimum side room of 90 mm each side of the opening for the frame uprights and 100mm to 210 mm of headroom above the door height. The stated door width and height does not include the frame. Most manufacturers produce standard widths from 7 ft wide to 10 ft wide in 6 inch increments and various heights…2000 mm, 2125 mm and 2250 mm being the three popular standard heights. From 10 ft wide to 18 ft wide standard width increments are every 12”. Simply measure your brickwork sizes and send them to us with questions. Fitting sectional door onto the rear of the brick opening. 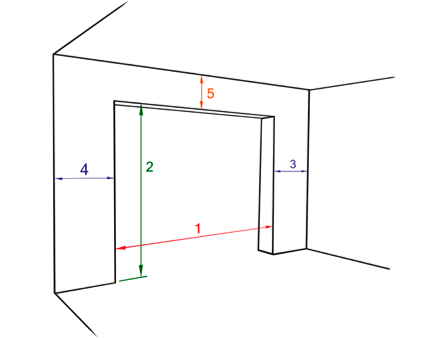 Diagram "Measuring Guide": As a general rule the brick work opening should be the same width (dimension 1) and height (dimension 2) as the door ordered. You will require a flat surface to fit the frame onto with side clearance (dimensions 3 and 4) and headroom (dimension 5) to accommodate the frame. 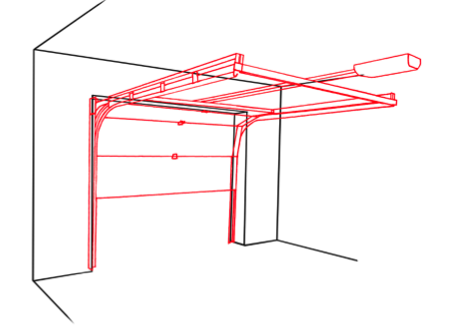 These clearances must extend uninterrupted down the garage for ordering height plus 300 mm to 750 mm depending on make and model.In the centre only where the motor fits you will need additional clear depth into the garage. You can show some of the fixing frame within the opening in order to avoid buying a made to measure door if you wish. It is normal to show upto 50 mm each side and upto 75 mm at the top. Sectional door fitted on the back of the brickwork. Fitting a sectional garage door between brickwork and underneath the lintel. 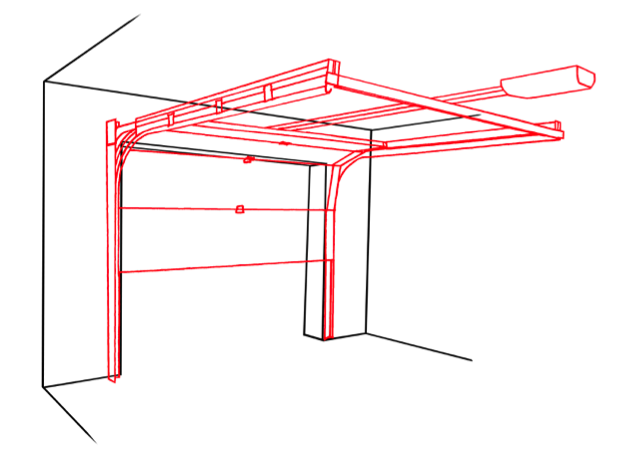 The stated door width is the distance between the steel frame uprights and the height from the floor to the underside of the frame crossbar. It does not include the frame leg each side and the frame crossbar at the top. For example: A 10 ft (3048 mm) x 7 ft (2125 mm) Hormann sectional door fitted between brick and under the lintel will require:a brickwork width of 3048 mm door width + 90 mm frame on left + 90 mm frame on right + 10mm fitting clearance = 3238 mm required brickwork opening width. The opening can be a little wider. The gap can be trimmed with a manufacturer’s trim kit or UPVC. The finished floor to lintel height will need to be at least 2125 mm door height + 95 mm cross bar depth + 10mm fitting tolerance = 2230 mm required floor to lintel opening height. The height can be a little more. The gap can be trimmed with a manufacturer’s trim kit or UPVC. Between brick installations also require a manufacturer’s Between Brick Fitting Kit. Sectional door fitted between the brick pillars.